You may see that I have painted my fingernails in a very demure taupe shade, which works nicely with reasonably tanned hands, or makes you look dead if you are pale. This shade is Eyeko’s ‘Posh Polish’. On my toes I used ‘Coral Polish’, which is exactly that; Coral Polish! It looks much more orange in the photo than it is in real life, and because I’m that kinda gal, I’ve taken an extra photo with the nails against something red. A book of stamps. See how glamorous it is round at mine? See how the colour is a lot more of a pinky-red next to the stamps? It’s a great colour though, really bright and fun. The bottles are very kitsch, and only £3.50 each, which I think is pretty darn good! The formula used in the polish is Toluene, Formaldehyde, DBP and Camphor free apparently. Something that I had never worried about before, but shall now add to my long list entitled ‘Things That May (or may not) Kill Me’ that I try to look at, oooh, at least once a decade. No, seriously, these things are bad, apparently, so it’s therefore good that Eyeko don’t include them. 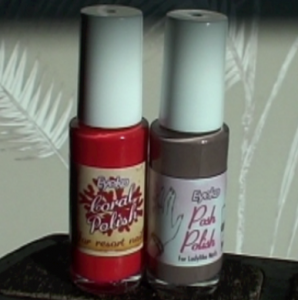 Anyway, I shall be wearing this ‘Posh’ taupe finger + ‘Coral’ bright toe for the rest of the summer, with perhaps a few little breaks so stave off nail-boredom. Eyeko Polishes in ‘Posh’ and ‘Coral’, £3.50 each from eyeko.com – if you type in the code E11285 at checkout, you’ll get a free gift with purchase! Previous Post Google Friend Connect – last time I'll mention it!